It's clear why Ryan Lochte had to admit to lying about getting robbed: There was video that captured him practically every step of the way. One of the videos was even put out by none other than Lochte himself, who posted a Snapchat video from the club he and his teammates were partying at the night he claimed they were robbed. From there, surveillance cameras pretty much tracked Lochte's every move, catching footage that contradicted a lot of the swimmer's story. For instance, The 32-year-old and his teammates were filmed leaving the club at around the 5 o'clock hour early Sunday morning, yet Lochte reportedly told police they left at 3. And, of course, there's even more when video surfaced of the swimmers arriving several minutes later at the now infamous Shell gas station. 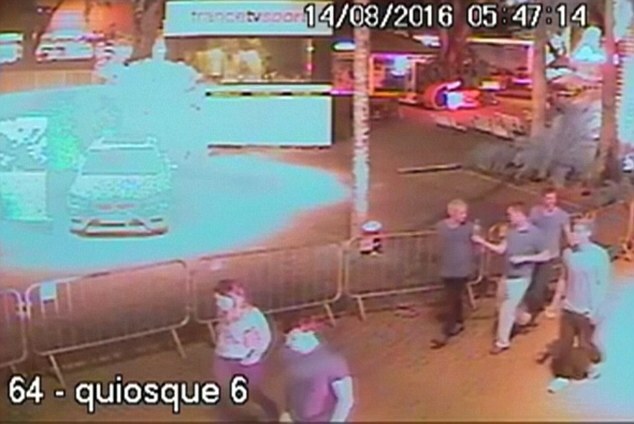 There, no fewer than three different angles of camera footage showed what the men were doing last night, and it definitely didn't look exactly like the robbery situation Lochte explained. And who could forget the first piece of video evidence that circulated? The video showed them walking back to the Olympic Village, where athletes room during the games, looking pretty put-together, without any apparent stress one would think robberies cause. So, yeah, it's no wonder Ryan Lochte finally gave up his cause. We'd literally seen every piece of evidence necessary to know his initial story wasn't true.